Budapest is a wonderful city with beautiful views along the river Danube. There are many hot springs in Budapest and as a result, over 100 bathhouses - some of which date back to Roman times. Below, you can find all the Budapest ferry timetables, journey times as well as our best prices. The Gellért Baths are the most famous in Budapest, built on the hot springs with art-nouveau architecture and Roman style columns. Relax in the thermal baths, treat yourself to a mud pack and enjoy a nice long massage. Professionals are on hand should you need any physical therapy during your stay. The Hungarian Parliament Building is one of the most stunning buildings in Hungary. Guided tours of the Parliament are available when the National Assembly is not in session. The design for the building was open tender in the late 1800's and the winning design was built to mark the 1000th anniversary of Hungary. The Budapest Opera House seats 1200 people, and is said to be one of the best opera houses in the world for acoustics. The building itself stands as one of the most beautiful architectural sights in Hungary, and is a great example of the Neo-Renaissance. Most tourists will visit Budapest in the summer, and that is a great time to visit. The sun shines, and a cruise along the river is relaxing and enjoyable. However, Budapest is at its most beautiful in the spring and in early autumn. In spring, the weather can be unpredictable but as the flowers begin to blossom and you will see all shades of green. In autumn, you don't get the scorching heat but there is still plenty of sunshine and the area is quieter. The leaves falling from the trees create a beautifully romantic setting. 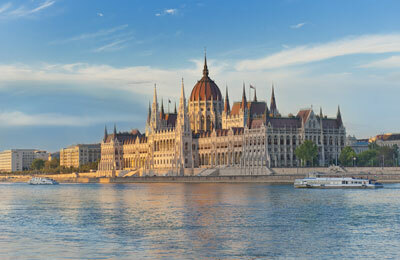 Mahart Passnave provides high speed hydrofoil services to Budapest from Vienna in Austria. You'll find unique cuisine in Budapest as well as some stunning buildings and of course the world famous hot springs. You can book tickets for Budapest right here with AFerry. Mahart Passnave operates high speed hydrofoil ferries resembling "an aeroplane on the water". The company prides itself on providing a fast service with ultimate comfort for passengers. On board the ferry you will find seating in air conditioned saloons, with an onboard buffet serving sandwiches and refreshments. The river Danube flows right through the middle of Budapest, separating the city into the two main areas of Buda and Pest. The ferry docks on the East side of the river and is right in the heart of the city so all amenities including ATMs are nearby. Budapest runs an efficient underground rail service and many of the main sights have stations nearby. Just look out for the M signs to find the nearest metro station. 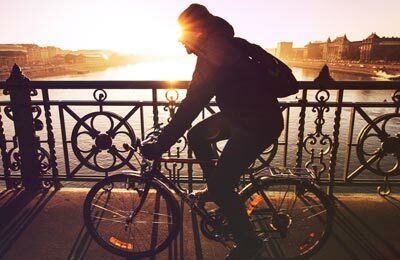 Particularly in the summer months, it is advisable not to use a car around Budapest. Like many cities, the traffic is heavily congested and you will have a much better experience using public transport. Mahart Passnave operates a number of domestic routes through Budapest, and also sightseeing cruises. Unfortunately domestic routes and cruises are not currently available to book through AFerry, but that doesn't mean they aren't worth doing. Book your Budapest ferry today simply and securely with AFerry.